Are you hosting a party for a bride or mother to be and looking for inexpensive yet stunning decorations for your party? Paper balls may be the solution for your problem This tissue paper pom pom tutorial is incredibly fast and easy to make, requiring almost no artistic abilities, and looks great when hung in groups. I found that Walmart sells tissue paper the cheapest. They carry many beautiful colors and cost around $1.00 per package. One package of American Greeting tissue paper contains eight sheets, which is enough to make one pom. 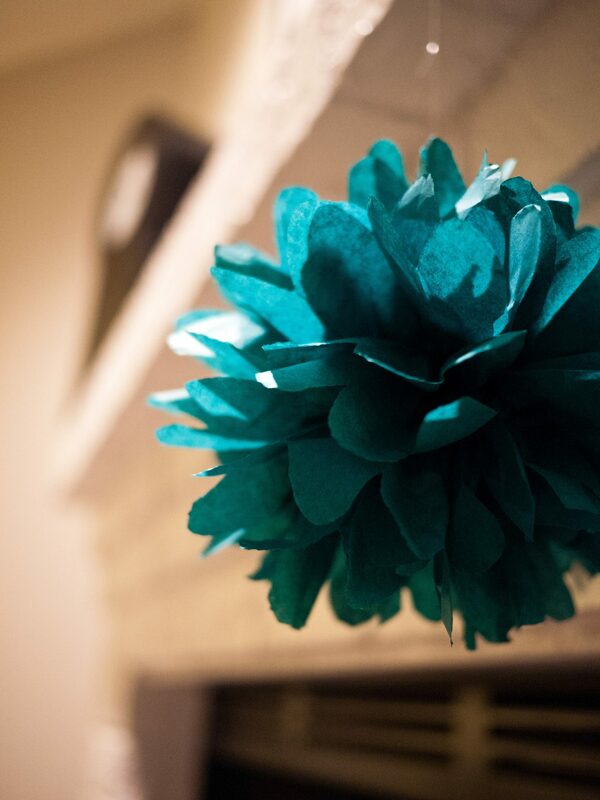 This tissue paper pom pom tutorial is fun and easy to do! Just follow the instructions below, and in no time you will have decorations that your guests will ooh and ahh over! Stack 8 sheets of tissue paper and fold accordion style in 1.5-inch increments. You may trim the edges using a rounded edge or a pointed edge. Carefully pull up the tissue paper one sheet at a time, and fluff into the shape of a round pom. Using fishing wire, tie one end of the wire to the pom, and tie the other end to hook or tape onto the ceiling.